The Dow Jones has its own manner, some stocks are fast, some stocks are slow and some are in between. No matter the powers behind the scenes Gann Angles will help the chartist with the 'Dow Jones Manner Watch'! With all the above going on we still can see how the Dow Jones migrates to its controlling Gann Angles. 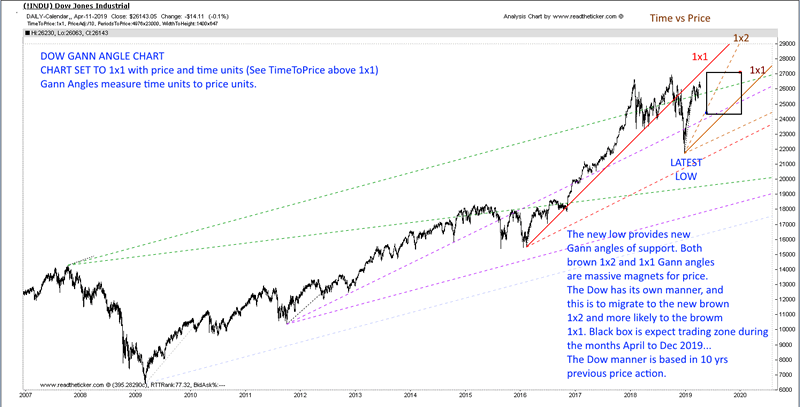 Now what to expect going forward into some of the most difficult months for stocks (New York summer months) is testing action off the 1x2 and 1x1 Gann Angles. You can assume this, the wise will most likely distribute stock float at these recovered price levels (thanks FED), the not so wise will likely assume the FED put will continue to save the day, every day. The black box on the chart is the expected zone for future price action (see blow). Of course we all see the traditional head and shoulders, but as we can all see this, it is likely to be managed by the puppet masters. And a another 'of course', if the brown 1x1 Gann Angle is broken a down swing swoon of 20% or more can be expected.